This week I thought it would be fun to tell you about the blogs I like to read here in Governors Harbour. 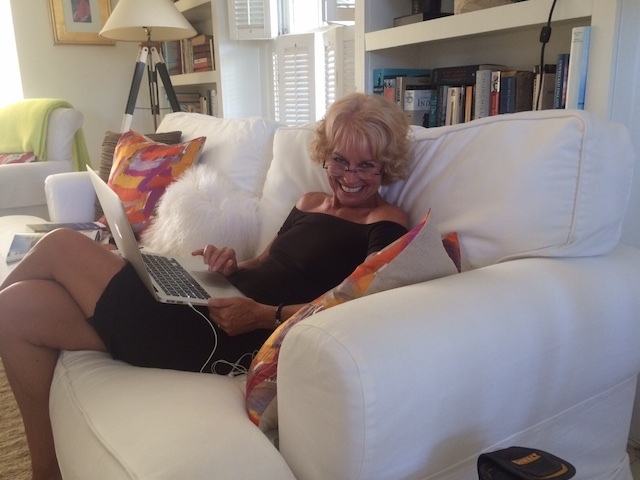 Writing my blog ….. or maybe checking out someone else’s ! Another blog I really enjoy is The Laundress. This is a fabulous company that specialize in laundry detergents – surprise surprise ! I met one of the founders – Gwen Whiting – when she came with friends – to stay in Governors Harbour. She totally endeared herself to me in many ways – not least by bringing me a range of The Laundress products – and that was it – I was hooked. Their Cashmere Wash and Stain Solution are two indispensable products for me. There are often great tips on cleaning and laundry – actually much more fun than it sounds !! Also very entertaining is Women Who Live on Rocks !! This site has some very funny stories written by all sorts of women who live on various islands in the Caribbean and of course many have them have a particular resonance for me …… There was one a few weeks ago about the humidity and sweating – too real …… It is great that different women from different islands all contribute to this one….. Finally – I just love That’s Not My Age – the grown up guide to great style. Written by an English journalist and former fashion magazine editor who has just published a lovely little book called Style Forever. Sometimes it’s about clothes, sometimes books, movies and art galleries – all sorts – another one that keeps me in touch with what is happening of the rock of Eleuthera ! Tell me some of your favorites – we are all always looking out for a little diversion and inspiration – right ? What a week in Governors Harbour ! Thanks so much for the Women Who Live on Rocks shout-out, I appreciate it! I look forward to checking out the other sites you linked. :) All the best to you on your rock! A pleasure – I really enjoy the writing ! I thrive on reading weekly the KurzweilAI.Net newsletter (that includes their blog), wunderground photgraphy, and the Cornell University bird sites. I know! Too scientific and techy. But, that’s not to say I don’t appreciate exploring serependipitously the myriad individualities and plethora of information online. I checked out the Laundress site. Nice! Since I used to provide instruction in the history, care and maintenance of silk, I noticed that information about rinsing in vinegar – vital to restoring the sheen and acetic balance resulting from silk processing – along with fabric types like Fuji, jaquard, damask, raw, oak leaf, etc. was lacking. Tepid water? Always. Cold water shocks silk and cashmere. So much for my two cents!